Dammit, Dana. The man just wants to dance. 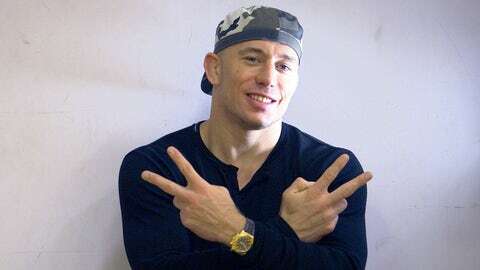 Georges St-Pierre was caught on video by TMZ busting a move at a Miami nightclub a week after beating Johny Hendricks last month at UFC 167 and awkwardly announcing he’d be stepping away from the sport for a bit. GSP, 32, is not nearly as smooth on the dance floor as he is in the Octagon. The vid shows him dancing with what appears to be an attractive brunette. No grenades for St-Pierre. The Canadian superstar also looks to be holding a bottle of Corona. C’mon, man – no NOS? Last week, St-Pierre officially said he would be taking a sabbatical from the UFC and giving up the welterweight title he’s held for six years, but left a door open for an eventual return. TMZ has reported that it has to do with his ill father and a girl he got pregnant in Montreal, but GSP has denied both things. He did say on the media conference call Friday that his life was "a freakin’ zoo. " If raging at LIV in South Beach qualifies as a zoo, throw us in a friggin’ cage. But seriously — party on, Georges. You deserve it.